Read 10 different stories from 10 different series. Click on the inside feature to view covers, read blurbs, and see book trailers. From bestselling authors W.J. 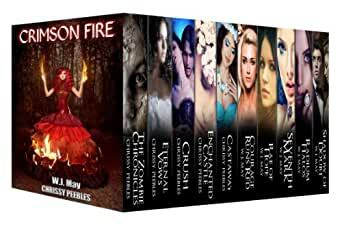 May and Chrissy Peebles - each story is a different genre of fantasy, paranormal and romance – all from different series! If you love free fantasy, dark fantasy, urban fantasy, and free paranormal, then give this book a try! Fans of Amanda Hocking, Richelle Mead, Stephenie Meyer, Bella Forrest, and L.J. Smith will love this young adult paranormal romance first-in-a-series by W.J. May & Chrissy Peebles. This boxed set contains ten stories by Chrissy Peebles and W J May. They are mostly forgettable paranormal romance/adventure stories aimed at the YA market. Best of the lot was Rae of Hope by W J May, although I encountered the word "freakin'" far too many times for my liking. It was different to the usual zombie/vampire/werewolf themes. There are better examples of this genre out there, although for the price it may be worth it to keep a teenager quiet for a few hours. It's usually hard to review an anthology. However, this one is a little easier for me because I like these authors. But, for each of the stories, I have the same complaints. First, each one needs editing, some extensively. Second, these were not complete stories as much as sections. The only one that could be considered a full book is "The Chronicles of Kerrigan." It actually had a conclusion. I feel like I just get a preview for free or on Kindle Unlimited, then I have to pay to get the other parts of the story. First off I'd like to say that I don't have high expectations from free books so I am pretty forgiving in my reviews. I base it on story line, and how it's told, not spelling and punctuation because what do you really expect from free books, unless it's really bad... And I have discovered some really good journeys through, various, free collections of books. With that said here is my review for each of the journeys I took in this compilation of books. This story had so much promise..... I wanted so badly to like it, and I think I would have if it wasn't for the main character. There was just too many parts where she would keep repeating herself over and over in conversations. Like the author didn't think you could fallow along without going over it 4 or 5 times. There was a "sad suspense" part where she kept saying "no no no please no" over and over and then when the mystery was finally solved, after 2 pages of her saying no, she was all " oh yea I knew it was ok" (not those exact words just trying to give you the idea). Sadly, I have no interest in getting the second one because I do not believe it will get any better. I am happy to say that I enjoyed this one! I think it stopped too soon but I guess that's how you get people, like me, to pay for books lol. There was some grammar mistakes but nothing too bad. It was kind of like she was writing then changed her mind what she wanted them to say but didn't delete all the words and this happened, probably, less than ten times so like I said, not too bad. The main character was also witty. Had a couple of chuckles which was nice. It also referenced Twilight (not by name) a couple of times so that was a little funny too. I will be getting the second book in this series and I'm looking forward to it! This was a very short book. Enough to peek your interest for the longer ones....and it definitely worked!! I really enjoyed this one. The story flowed very well, the character's were smart and funny, and mysteries needed to be solved, add some paranormal into the mix and you Have the makings of a good story. There was a couple of typos but nothing to obtrusive. Things like a second E In "the" so it was thee. But very few! I am definitely getting the next book in this series, my Haunted Fairytale!! This was a very exciting story. From the very beginning it was one thing after another. Action packed is an understatement. All the "odd" things reminds me a little of "Journey to the Center of the Earth". This story really shows Chrissy Peebles creativity. So needless to say, yes I enjoyed this book. I don't remember any grammar errors but there may have been one or two, it seems to get better with each story I read of hers. I haven't looked at the order of when they were written so either her editing got a lot better, or she just got more lazy with it. Either way, this was a really good story. APOCALYPSE – UNDERWATER CITY Part 1 to The Hope Saga By Chrissy Peebles. I have to start off by saying the cover doesn't really match the story.... with that off my chest I'd like to say that the story wasn't bad. It was short, of course. I'm sure this was just to get you wanting more. I did not noticed any editing errors, I was tired when I read this one so some may have slipped by me but none that I can recall. It was an interesting story and a unique twist on the end of days/rebuild earth story, interesting enough for me to want to check out the next one, but not so much that I'm dieing to see what happens and have to get it now. I will be putting it on my wish list though. Other than some editing errors, this book was great! Up to this point, it is by far my favorite one yet! Loved the new twist on paranormal super beings. And I couldn't get enough of all the magic, mystery, and just plain old fun this story had. One of the things I liked most about this book is the heroin, she was determined not to let her parents past , nor her bullies, kick her down. She just kept going with who she knew she was, not who everyone thought she should/could become. Kept me wanting more into the late hours of the work night lol. I am so excited to start the next book in the series! I definitely recommend this book, just do your best to ignore the errors and you will love it too. **Please note, this is only part 1 of book 1. Part 2 is separate. So sad this was a 2 parted. There was some editing errors but when you get free, or $.99 books, it kinda comes with the territory. With that said, I really loved this book so far. I will definitely be getting the second half and with any luck that that is as good as the first.... I will be getting the series! Now I'm torn because I don't feel like I finished the book and I don't like that. When I start a book I have to finish it, even if I hate it, because I might be missing something good. So do I get the second half and read that now, or continue on with this one??? Ugh. Either way I'm not finishing one before I start another..... ok I will finish this collection of books, but part 2 will definitely be the first one I read when I'm done. The story line was definitely a new one so I was excited to see what it was all about.... and that was about the extent of my excitement. I could NOT get in to this book. I could not find any excitement in it. It felt very monotone to me. The main male character was from England and "migrated" the America, but the writer kept putting in English slang coming out of American's mouths. And during conversations the author would write something like, I went to the bathroom and slipped, lol... (that wasn't the words used except for the "lol" part) who actually says "lol" in a conversation unless you're like maybe 12? There was a few instances where that happened. So that, along with the monotone feeling I got, I am just not interested in going further with this series. I do read the reviews of each of these books before I read them in this compilation of books and there was a few that couldn't get into the story either, and a lot that loved it. So even though it's not for me, I do encourage you to at least give it a try. Who knows, you may love it! With that said, I really liked this story. I was into it by the end of the first chapter. Not an original idea, but still a good remake. I liked all the character's, they all had great personalities, funny, and did not seem to be troublemakers. The author really needs to learn American slang for his books because English slang kept getting popped in. America's don't use "Kilometers" to measure distance, nor do we call a flashlight a "torch". I find these kinds of mistakes through out all of her books. Along with adding extra words that don't belong. I do and I don't recommend this book because what I read so far was good, but what if the part you actually have to pay for, the 2nd half of the book, turns out to be horrible... So I guess it's a read at your own risk type of thing, ugh! I wish I'd could give you more with all of the W.J. May's stories but I was only able to read half of them, if even that, because that's all that was given for us to read. I am very disappointed that all of W.J. May's "books" on here wasn't even a full book, not one of them! And that's how they are sold too. I find it very crappie of the author to do that and because of that I will not be reading any more of her books. I liked some of the books from this series especially W.J. May's books. The fact that most of the books didn't have an original story line kind of put me off. There first few books sounded like they were a cross between Twilight and The Hunger Games. I was a little disappointed in the way that Chrissy Peeples books were almost all the same. The main character looked the same, the same lines from each book were identical. I did like some of her stories but wish she had used better lines and different lines. I think this is great for anyone to read, especially teens. A great way to sample multiple books. Each story is different from the others and you can continue the journey as each book is the first in a series. The only down side is there are a lot of typos which interrupts the flow as you are reading. 4.0 out of 5 starsA collection of medium to short stories! Most of the short stories were well written and some left you wanting more. There were so many that it is hard to pick out one, so this is a general review. Some were a little longer and I felt like I had time to get invested in the main character, and some just long enough to get you interested enough that you didn't want to put it down. Others were a one time read.